The information on this page comes from various sources that I have managed to find on the web - mainly from magazine news articles of the time and some recollections from Geoff Boyd. I have tried not to quote unsubstantiated comments from various other websites as I know that many are factually incorrect - that includes the ubiquitous Wikipedia! During the Cold War, Soviet block access to Western computer technology, at least legally, was limited by the embargos in place at the time. Although there was some computer manufacturing capability in the region, this was limited to indigenous designs, or those illegally cloned from Western designs such as those of IBM and Apple - and, "when you care enough to steal the very best", DEC! In March 1985, Mikhail Gorbachev became General Secretary of the Communist Party of the Soviet Union - the leader of the Country. Gorbachev was determined the revive the ailing Soviet economy through a number of reforms, including a campaign of economic restructuring christened "perestroika", intended to modernise industry and agriculture. The Party leadership realised that the country lagged well behind the computer technology of other countries such as those in Western Europe and the US and introduced the new subject of Informatics (computer science) in state schools in 1986 to teach pupils IT skills. It was recognised that in order to support the rapid deployment of computer technology in schools, domestic manufacturing capability would be inadequate and foreign assistance would be required. In preparation for a likely tendering exercise, a 10 day long micro computer exhibition, Technobuch '85, was held in Moscow early that year. Three UK manufacturers, Sinclair, Acorn and Memotech exhibited at the show, with both the Acorn and Memotech machines able to demonstrate Cyrillic character sets. Sinclair was represented by its European Development Manager, Acorn by 3SL, its Eastern European distributors and Memotech by UK distributors, The Spectrum Group. Sinclair managed to sell all of the ZX Spectrum machines on its stand (12) to the Russian Ministry of Higher Education and Acorn won orders for the BBC Micro to the value of £20,000 from the Moscow Education Institute at the show - the culmination of a years work by 3SL. Unfortunately, The Spectrum Group was unable to actually sell any Memotech machines, as they had not received the necessary export licenses in time. An inauspicious start to Memotech's efforts on the Russian bid, but they were invited back to give an exclusive demonstration of the MTX in the March of 1985. During that visit, The Spectrum Group did manage to sell £20,000 worth of Memotech MTX512 equipment to the State Committee for Professional and Technical Education. It is interesting to note that each of the three contenders appears to have had some support from different state and city institutions. After the Memotech trip in March, Memotech and Sinclair were both invited back to Russia in April for further negotiations, it would appear that Acorn may have been eliminated from the process by then. 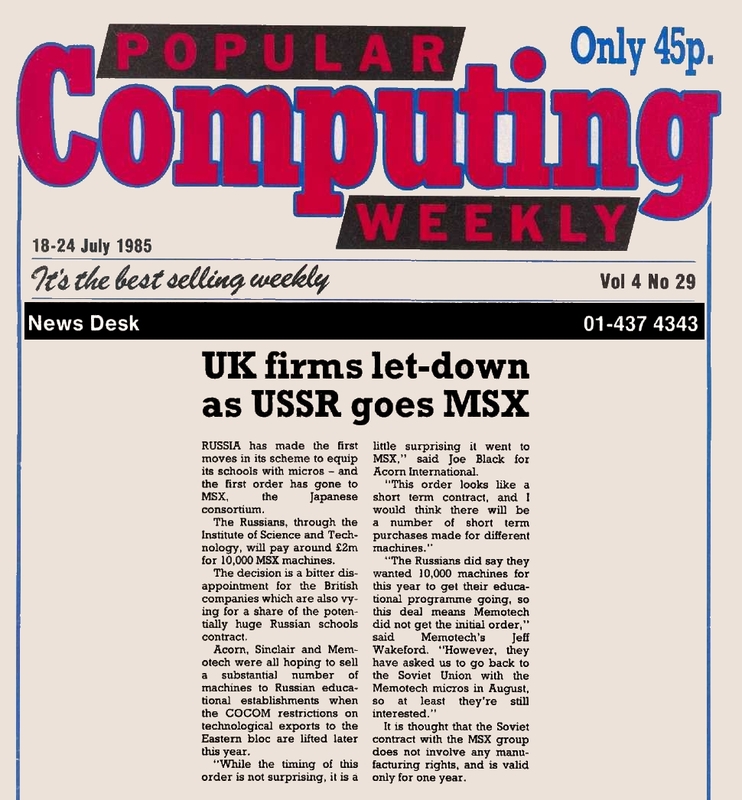 According to Popular Computing Weekly, (PCW), at this point, Sinclair had teamed up with ICL who were tasked with carrying on the negotiations on Sinclair's behalf, whilst Memotech continued to work with The Spectrum Group. 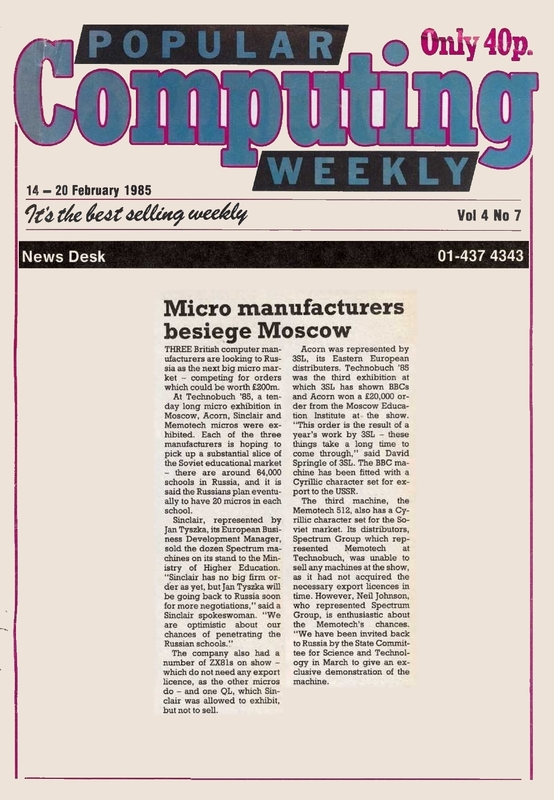 The article in Personal Computer News states that Memotech had had to get permission from NATO to export their computers to an Iron Curtain country, a reference to the embargo noted in the background section above, but I am not sure that it would actually have been NATO that needed to grant such permission and was more likely to have been the CoCom export control committee. A factor in Memotech's ability to get export licenses was their use of the CP/M operating system for the FDX since CP/M was not included in the embargo whereas IBM PCs and MSDOS were included. However, by the July of 1985, seemingly to the surprise of the UK contenders, the Russians announced that the first order, for 10,000 machines, had been awarded to Japan with an order placed through yet another body - the Institute of Science and Technology. 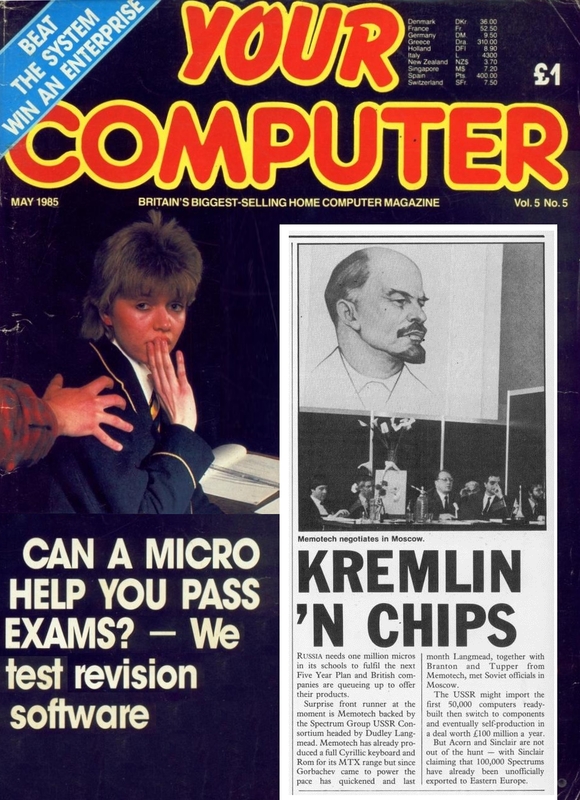 Again, according to Popular Computing Weekly, the Russians paid around £2m for the 10,000 machines that they required by the end of the year in order to get their education program started. The winner of this first order was the Yamaha YIS503IIR (MSX-1) - a system with very similar technical specifications to the MTX512, more details can be found on my msxinfo page. 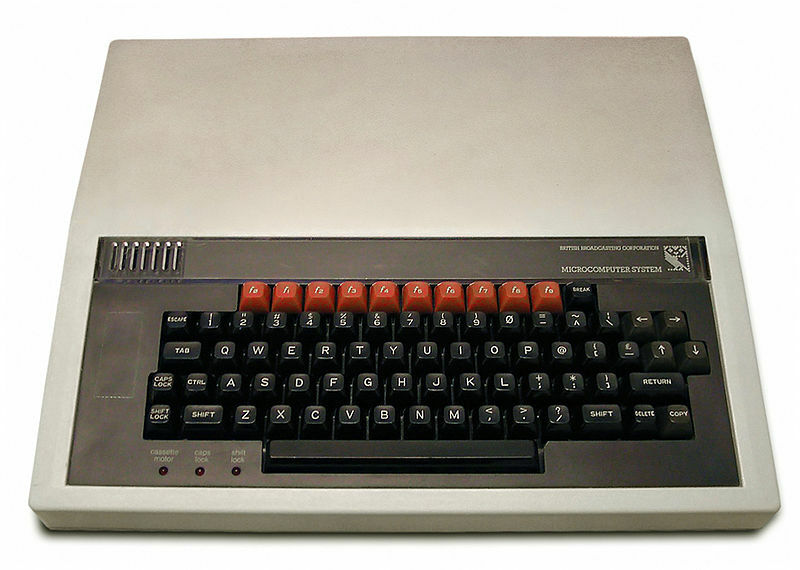 It appears that even in the light of this announcement, the UK manufacturers had not given up all hope of winning a contract from the Russians - believing that this first order would be the first of a number of short term purchases of different machines and that the MSX contract was only valid for 1 year. Memotech believed that they were still in the running for subsequent orders and had been asked to return to Russia in the August with the MTX computer. Although Acorn are quoted in the July PCW article, it makes no mention of Sinclair at this point and it may be that they too had been dropped by the Russians, possibly because of the limited interfacing abilities of the Spectrum compared to the Memotech or Acorn machines. One of the goals of the new Russian schools program was to provide education and training for robotics and control applications. 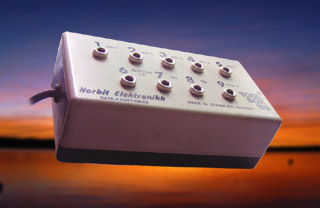 In an attempt to secure the contract, Memotech had worked with the Norwegian company, Norbit Elektronikk, to develop an add-on electronics unit to be offered alongside the CP/M based FDX disk system and with Oxford University to develop a Russian (Cyrillic) version of the System and BASIC ROMs, along with Russian documentation and keyboard. A very limited number of prototype MTX computers were built for the bid, these were actually a different size from the standard MTX512 - they were cut-down to remove the numeric keypad and reduce the cost. The majority of these "standard" prototypes were the usual MTX black and only a couple of prototypes were installed in red cases for show. 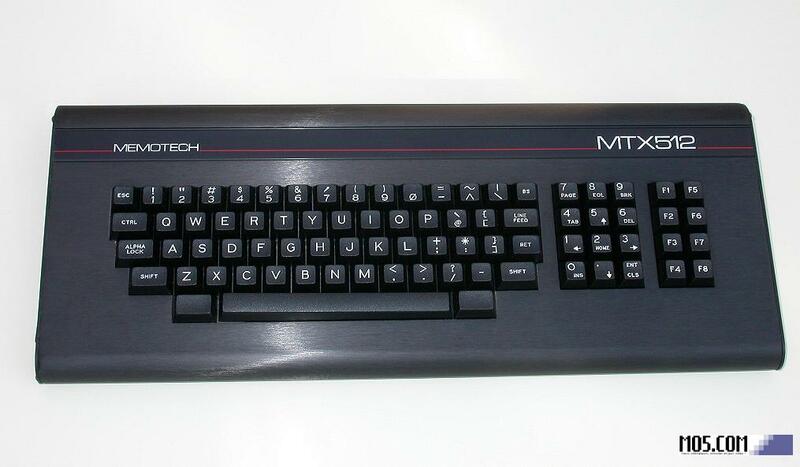 There are thought to be a very limited number of standard MTXs which have had red covers fitted using keyboard covers produced during development of the prototypes - these were probably put together "unofficially" by Memotech employees in the factory at the time, like the example shown at the top of this page. However, without the editing keys on the numeric keypad, user interaction with BASIC would have been difficult, even with the Russian ROM that Memotech had developed. Perhaps it was the function keys that were removed to reduce cost? Although I have not found any supporting evidence, I think that the Memotech Node (token ring network) system may have been part of the Memotech offering. This would have allowed a school classroom to have a single FDX disk system providing file and network services for a number of client machines - a similar feature was included in the Yamaha MSX system. To compliment the hardware, Memotech had SciSoft develop a suite of Russian language programs on how to use and program micro-processors. (In addition to developing a wide range of educational software for the BBC Micro, Dragon and Sinclair ZX81/Spectrum computers, SciSoft had previously produced a range of educational programs for the MTX range in English - most of these are available in the Education section of my MTX software downloads page). The Misolima Publishing blog for Anne Selene describes the MTX interface as a "SuperToolBox" that was developed from ToolBox '85. 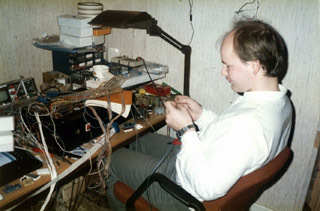 "Anne Selene with her Norwegian company, Norbit Electronics located in Steinkjer, Norway along with the Memotech factory in Oxford and the University of Oxford, England, developed its ToolBox ’85 into Super-ToolBox for Memotech MTX computers. This system consisted of a complete hardware I/O system to be used in robotics at the Russian schools. In connection with Memotech’s plans to provide Memotech computers to 65 000 Russian schools, Super-ToolBox was also meant to be delivered as part of the complete package." Rather than the joystick port interface described in the Norbit advert below, the "Super-ToolBox" was designed to be interfaced using the User I/O port available as a 20 pin DIP socket on the MTX system board. Other than the prototype used for demonstration purposes, I don't know if any more of these system were actually built, but I suspect not. 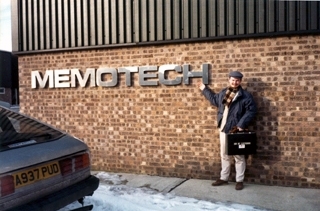 One of the owners of Norbit Elektronikk arriving at the Memotech Factory in Witney, Oxfordshire. Norbit worked with Memotech at the factory, developing the prototype for the Super-Toolbox which was offered with the Russian schools bid. The Super-Toolbox was built inside a customised version of the FDX case. If you look closely, you can see the MTX keyboard peeking out on the left. Pictures from the Misolima UK website. Anne-Seline also recalls that "the red MTX demoed in Moscow was a lash up of prototyping boards inside the red case". Memotech's commitment to the Russian schools bid necessitated significant investment of time and money to allow them to offer a system to meet the exact needs of the Russians. Even after the award of the first order, Memotech continued to develop the hardware and software during the second half of 1985, committing scare resources even while domestic sales were declining, unfortunately, nothing came of these efforts. You will find various pages on the web attributing failure to secure the Russian deal as a major factor in Memotech's demise but Geoff Boyd does not support that assertion. By the time of the Russian bid, the writing was already on the wall, not just for Memotech, but for the majority of the UK home computer manufacturers of the time. 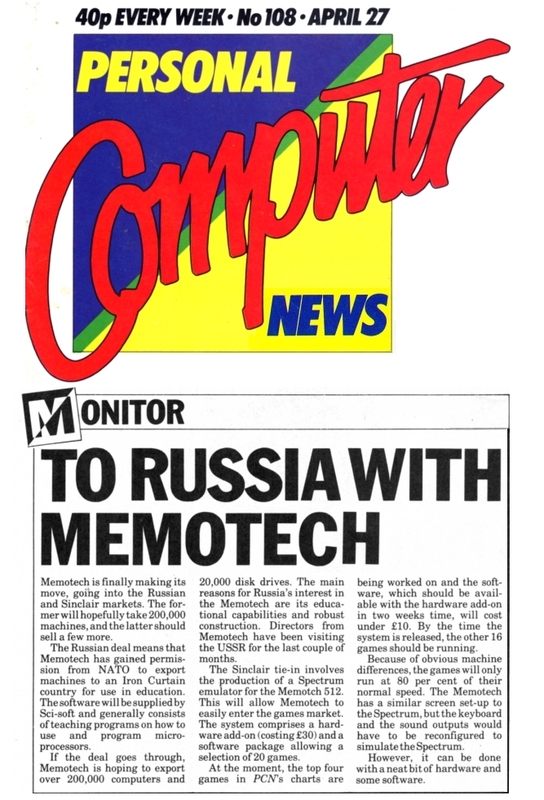 The Russian deal was the last throw of the dice for Memotech and when it failed, Memotech had nowhere to go and the company was put into administrative receivership in early 1986 before being re-launched by Geoff Boyd as Memotech Computers Limited. You can read more about the circumstances of the failure of Memotech Computers on my MTX About page. The Russians went on to place additional MSX orders for MSX-1 and MSX-2 systems from a number of manufacturers including Yamaha, Daewoo and Toshiba for installation in Russian schools. Discussing the exhibitions by Acorn, Sinclair and Memotech at Technobuch '85 in Moscow as part of their, ultimately unsuccessful, attempts to gain access to the Russian schools market. Memotech and Sinclair were invited back to Russia in the April of 1985 for further negotiations. Confirming granting of export licenses to Memotech for the sale of MTX computers to the Eastern Block. Describing the potential opportunity in Russia and noting "Memotech as "the surprise front runner". The writing is on the wall - the first order goes to MSX! I have an old magazine, not sure which one, advert for "ToolBox '84" from Norbit which looks like an interface for the joystick port which provided a user programmable interface for a number of micros, including the MTX. You can see the advert here. This interface seems to be the origins of Misolima, there is a really interesting article on their website which describes their early days, including interfacing to the Memotech computer. Misolima has a photo of the ToolBox '85 unit on their UK website. From their humble beginnings with the 8-bit micros of the '80s, now based in Thailand, Misolima have grown to produce a range of embedded systems used in home and office automation.